Will the Real Conflict Please Stand Up? Whether you are considering your own organization’s training department or you are part of an external training company, this framework should be considered in the same way. 1. Establish a clear mission that is able to be communicated simply. Make clear the training department mission (or contractor’s mission, in some cases) by defining its purpose, including what the training mission is not. What is the training and development function within the organization? Do other groups in the company also take responsibility for some training initiatives? How do they overlap? 2. Develop the business case for learning. What makes the learning initiatives worthwhile, strictly from a business perspective? What is the business cost (for design, delivery and reinforcement) as well as the opportunity cost (the value of the participant’s time, and expected impact)? 3. Carry out all training activities with specific, measurable goals. What is the expected outcome of each effort? For example, “increase customer service skills” doesn’t take us to the necessary level of clarity. Try something more like, “Increase customer satisfaction by 30% over six months”. Follow the Action Steps to get started making the business case for your training department or your training services. 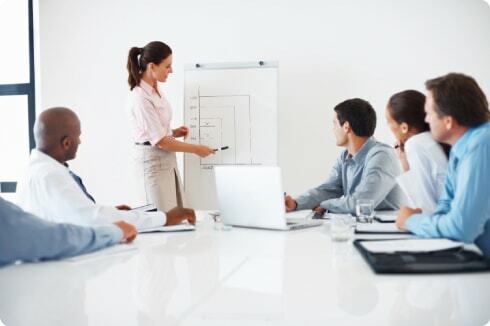 Learn more about how to manage corporate training like a business. Difficult conversations are a normal part of life. No matter what personal or professional gains you make, there will always be difficult conversations that have to take place. According to the Family Institute of Cambridge and Harvard Law School’s negotiation workshop, withineach difficult conversation, there are actually three conversations happening. That is, there are three undercurrents driving the energy behind each conversation. This is the disparity between each parties’ interpretation of what has happened. Who is right? Who is to blame? No matter how we phrase it, in this conversation, we are usually telling the other side that they are to blame. Shift the focus away from establishing blame and toward an acknowledgment that we can never truly know other peoples’ intentions. Whose feelings are valid? Should they be acknowledged, or peeled off of the conversation? How can that happen? How should you address feelings without walking into a landmine? Regardless of how much you try to check your emotions at the door, there are emotional undercurrents to most difficult conversations. Even more, difficult situations don’t just involve feelings, they are based on feelings. Sometimes a situation is so sensitive that feelings can’t even be broached. You will benefit from knowing how to acknowledge and talk about the feelings associated with the situation. What does this situation mean to each of us? What judgments are we likely making about each other? How is this affecting self-esteem? This conversation asks “What does this say about me?” Even when you are the one who is delivering the bad news, identity still comes into play. How will people see you after this conversation? The bottom line is that conflict resolution and starts by being able to effectively listen to the perspectives of the other person in the conflict situation and depersonalize the conflict.